This is one of the major events initiated by PolyU to foster closer collaborations and explore innovative technologies with top-notch universities and institutes around the world through forming strategic research and development alliances. Experts speaking at the Forum included Dr. Ravi VAIDYANATHAN, Senior Lecturer in Bio-Mechatronics, Director of International Collaboration, Imperial Robotics Forum, Imperial College London, UK; Dr Ahmed CHEMORI, Senior Scientist in LIRMM-CNRS University of Montpellier, France; Proessor Shuo LI, Deputy Director of Shenyang Institute of Automation, Chinese Academy of Sciences; and Professor David M LANE, Professor of Autonomous Systems Engineering, Director of Edinburgh Centre for Robotics, Heriot-Watt University, The University of Edinburgh. They shared themes that covered bio-mechatronic sensory motor control, autonomous underwater vehicles, marine robotics for deep-sea exploration and operation. The professionals exchanged valuable views and experiences on marine robotics technologies. Dr Xing-jian JING, Associate Professor of PolyU’s Department of Mechanical Engineering and a seasoned researcher on bio-inspired dynamics, control and robotics, highlighted that, “Technologies related to underwater exploration and manipulation as well as new bio-inspired underwater robots would be two important areas to be explored in marine robotics. These key marine robotic technologies are important to ocean exploration and exploitation. They also contribute enormously in environmental and pollution study, critical underwater infrastructure inspection, natural resource exploration, and sensing and mapping of ocean for specific tasks and missions”. Professor Hau-chung MAN, Dean of the Faculty of Engineering, PolyU, said, “PolyU is committed to conducting impactful research and promoting knowledge transfer. While we are situated in a coastal city like Hong Kong, we can leverage our geographical advantage as we conduct research on ocean exploration. Capitalising on our solid network with leading researchers in the world, we strive to pioneer in developing marine robotic technologies and deliver global results”. PolyU signed a Memorandum of Understanding (MoU) with ICL and SIA last month respectively. The two MoUs reinforce the partnership between PolyU and the top research institutions of related areas and firmly declare the intentions of advancing joint research, particularly in the areas of innovative robotics technologies in relation to ocean exploration as well as ocean exploitation for scientific research and civilian applications. 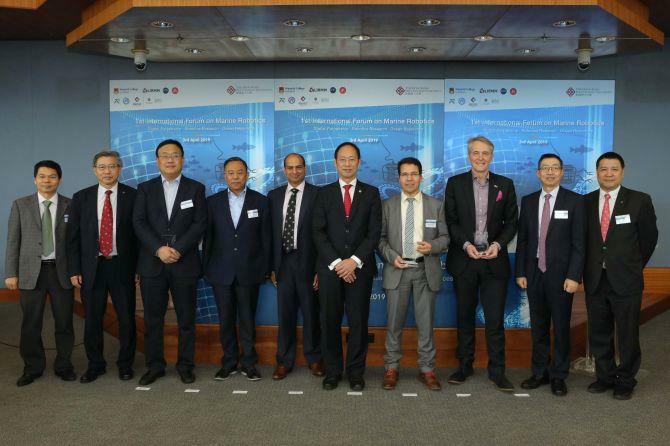 Committed to supporting the HKSAR Government’s InnoHK initiative in developing Hong Kong as the hub for global research collaborations, PolyU has submitted a proposal to the HKSAR Government under the [email protected] research cluster initiative for setting up an international joint research centre with top-notch research institutes on marine robotics. PolyU also plans to launch a series of events on this emerging research area, targeting to explore and promote high impact maritime robotic applications in various industries, bringing extensive benefits to the society. While boasting a proud history of 80 years, The Hong Kong Polytechnic University (PolyU) is a vibrant and aspiring university with a forward-looking vision and mission. Committed to building a talent pipeline and scaling up research strength for advancing the development of Hong Kong, the Nation and the world, PolyU provides the best holistic education to nurture future-ready global citizens and socially responsible leaders; conducts high-impact interdisciplinary research and proactively transfers knowledge to create value and build impact. We embrace internationalisation and engage the Nation for education and research through strategic partnerships and collaborations. With “Opening Minds. Shaping the Future” as our brand promise, the University is currently offering more than 160 taught programmes via six faculties and two schools, engaging in 3,200 exciting research projects and partnering with over 660 institutions overseas and in mainland China on a wide variety of initiatives. We have over 400,000 alumni around the globe and 28,000 students.